Berry Lumber is an over 4 Acre Drive Thru Lumber Yard at Auburn Blvd. & Pasadena Ave., Sacramento. Along with Berco Redwood conveniently located across the street, we carry quality lumber materials for all your indoor and outdoor needs. We operate on the simple principal of customer service. 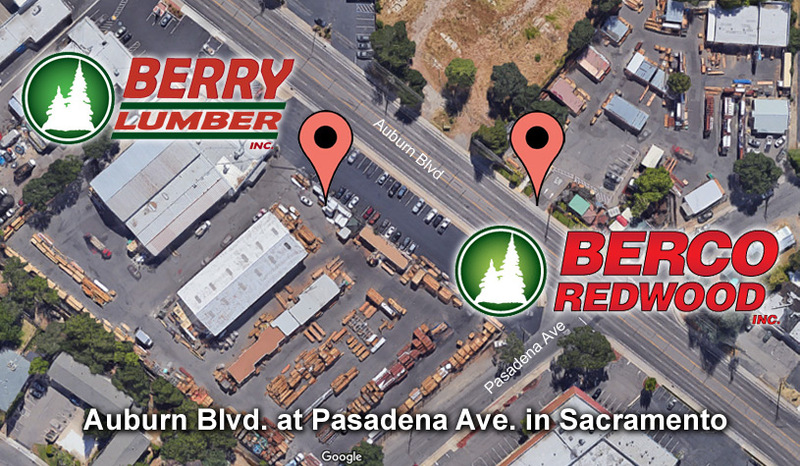 Berry Lumber has a great corner location which means easy access from Auburn Blvd. Ordering and loading is easy at Berry Lumber with drive-thru covered lumber sheds & account transfer to and from Berco Redwood—all with no, or low minimum orders. In addition to high-quality products, you'll also find unbeatable service. At Berry Lumber you can bring in your plans and we'll prepare a take-off list of materials for you, pull your order, load it for you, or schedule a delivery so you don't ever have to leave the jobsite! We service homeowners & contractors alike... come on down or give us a call--we're happy to help you!